You can set and manage alarms using the Clock application on Samsung Galaxy Note 4. The Clock application is a pre-installed app that offers the functionality of a bedside clock and alarm clock. 2. Touch Clock to launch the app. 3. If necessary, touch the Alarm tab. 4. To create an alarm, touch the plus (+) sign/icon. 5. Configure the following settings: Time, Alarm repeat, Alarm type, Alarm tone, Volume, Snooze, Smart alarm, and Name. Time - to set the time the alarm will sound, touch the up or down arrows and AM/PM. Alarm repeat - to repeat the alarm on the selected days weekly, mark the checkbox to Repeat weekly. 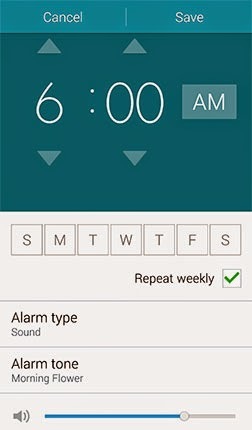 With Alarm repeat, you can select which days you want the alarm to repeat. Alarm type - the option used to choose whether the alarm should play a sound, vibrate, or both. Alarm tone - the option used to choose the tone played when the alarm sounds. Volume - to adjust the alarm volume, drag the slider. Snooze - to turn Snooze ON, touch the OFF slider. To adjust the Interval and choose if you want the alarm to Repeat, touch Snooze. Smart alarm - to turn Smart alarm ON, touch the OFF slider. When enabled, the alarm will sound quietly a few minutes early and slowly increase in volume. To adjust the Interval and Tone, touch Smart alarm. Name - the option used to enter or set a name for the alarm. When the alarm sounds, the name will be shown on the screen. 6. To create the alarm, touch Save. If you want to edit an alarm, touch the alarm in the Alarm tab. How to Stop or Snooze an Alarm on the Galaxy Note 4? Touch the X icon and swipe in any direction to stop an alarm when it sounds. Touch the zZ icon and swipe in any direction to use the Snooze feature when the alarm sounds. You need to turn on the Snooze feature in the alarm settings beforehand. How to Delete an Alarm on the Galaxy Note 4? 2. Touch Clock to launch the clock application. 4. Touch and hold the alarm you want to remove or delete. 5. Touch the Trash icon to delete the alarm. You can also turn off an alarm and save it for later use. To do so, simply touch the Alarm clock (green) icon. To turn on the alarm touch the same icon to enable it.